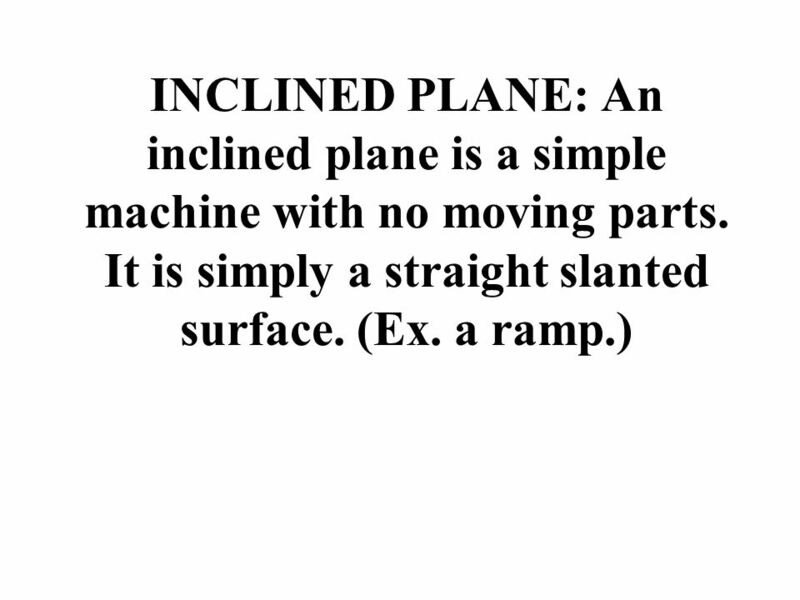 2 Simple Machine - a device that changes the size or direction of a force being used to do work. 3 WORK: You are doing work when you use a force to cause motion in the same direction. 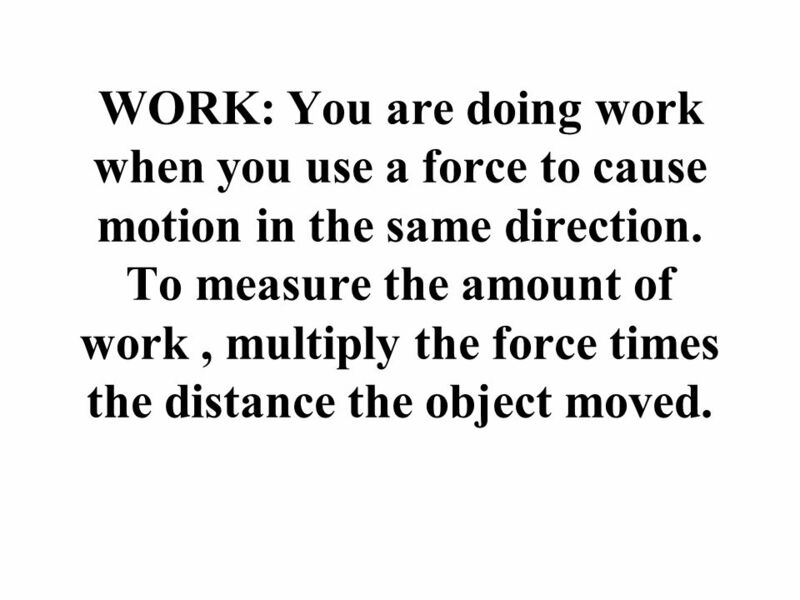 To measure the amount of work , multiply the force times the distance the object moved. 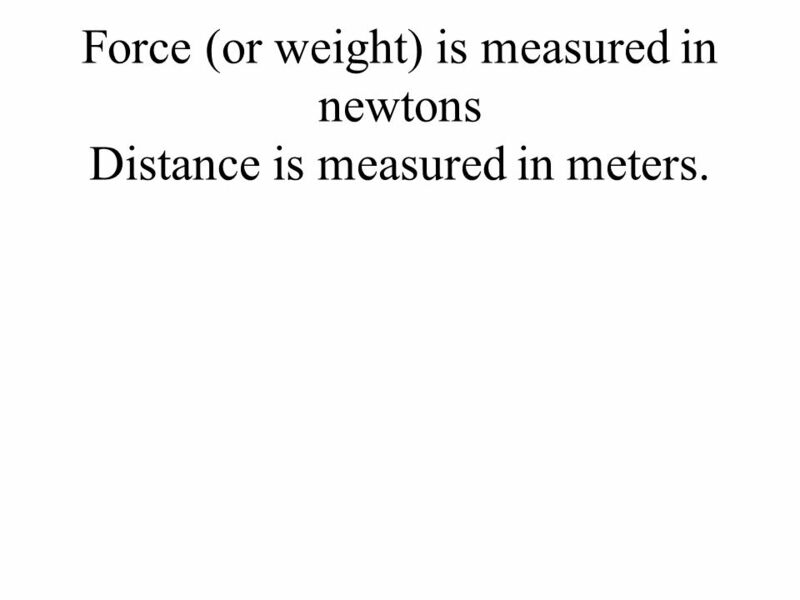 5 Force (or weight) is measured in newtons Distance is measured in meters. 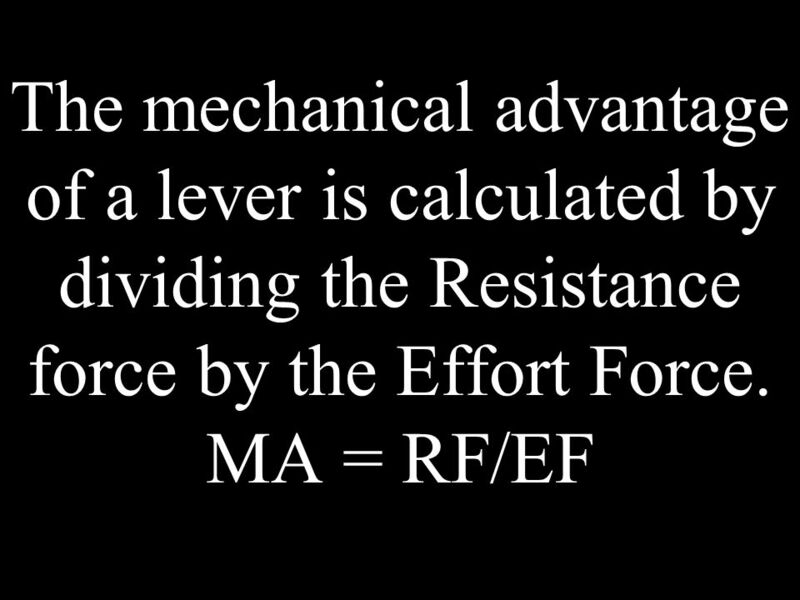 7 We can measure how much the force is changed by calculating mechanical advantage. 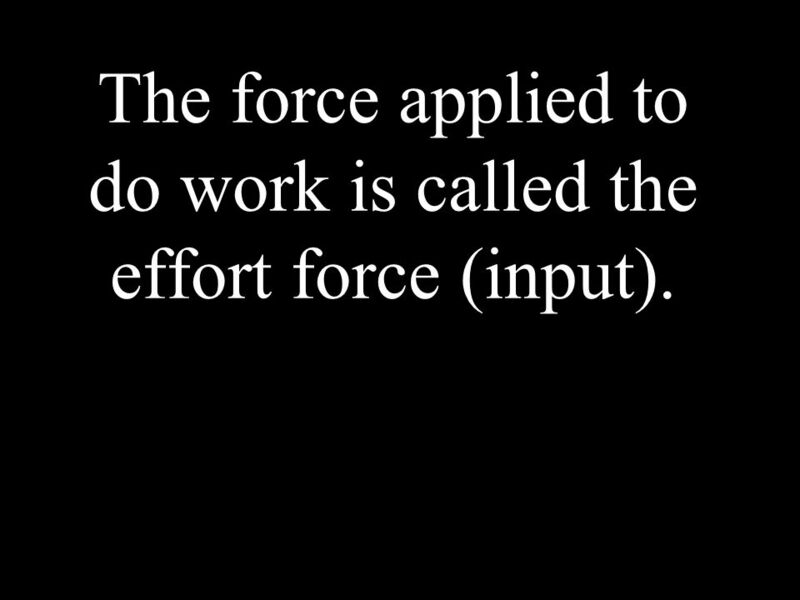 8 The force applied to do work is called the effort force (input). 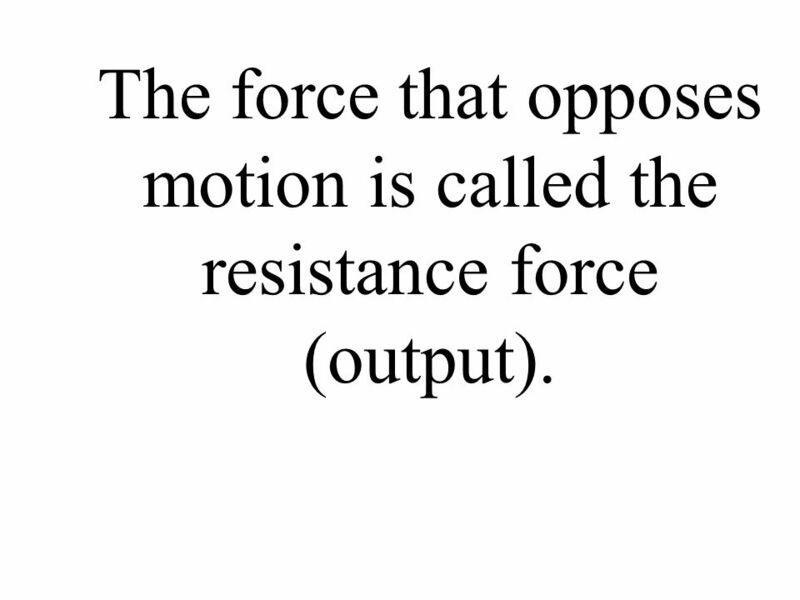 9 The force that opposes motion is called the resistance force (output). 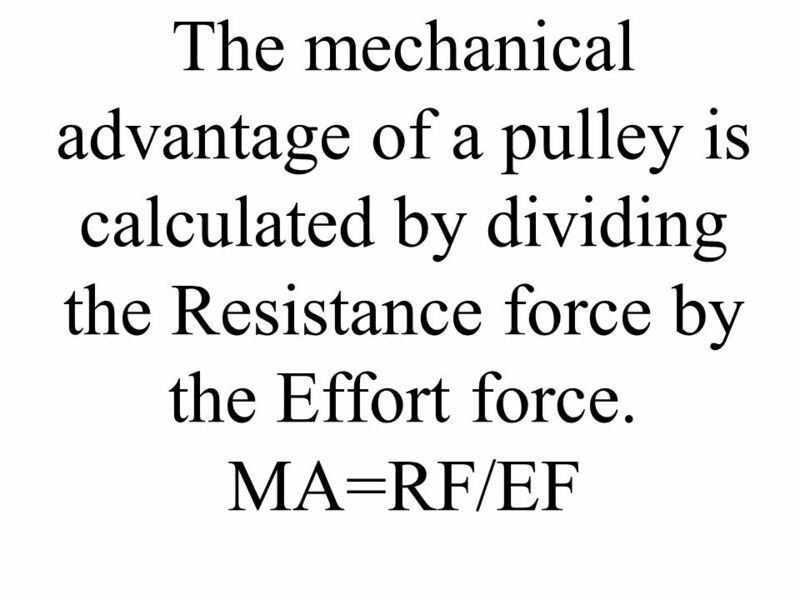 10 Actual mechanical advantage is the number of times a machine multiplies an effort force. 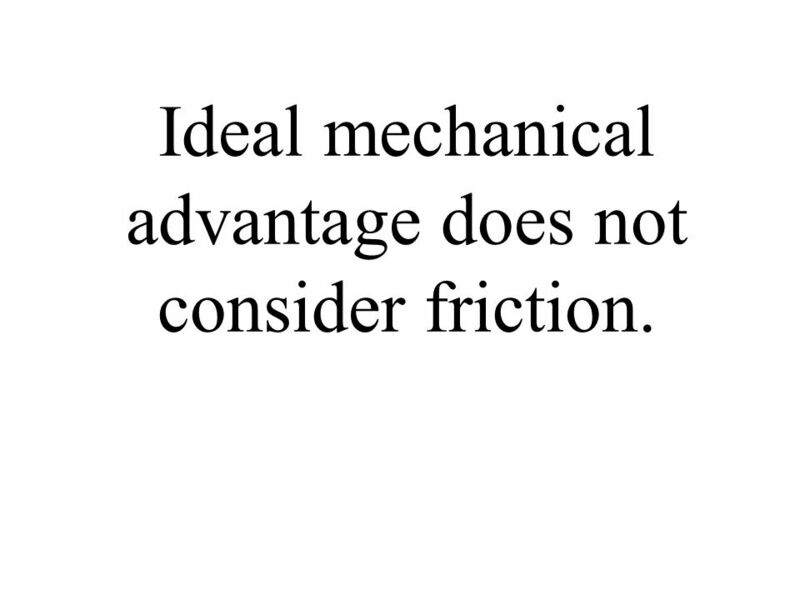 11 Ideal mechanical advantage does not consider friction. 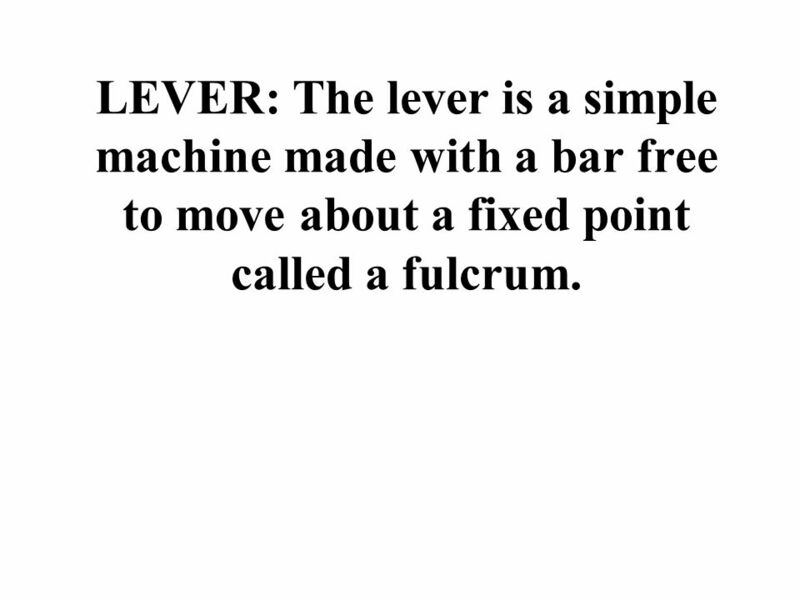 13 LEVER: The lever is a simple machine made with a bar free to move about a fixed point called a fulcrum. 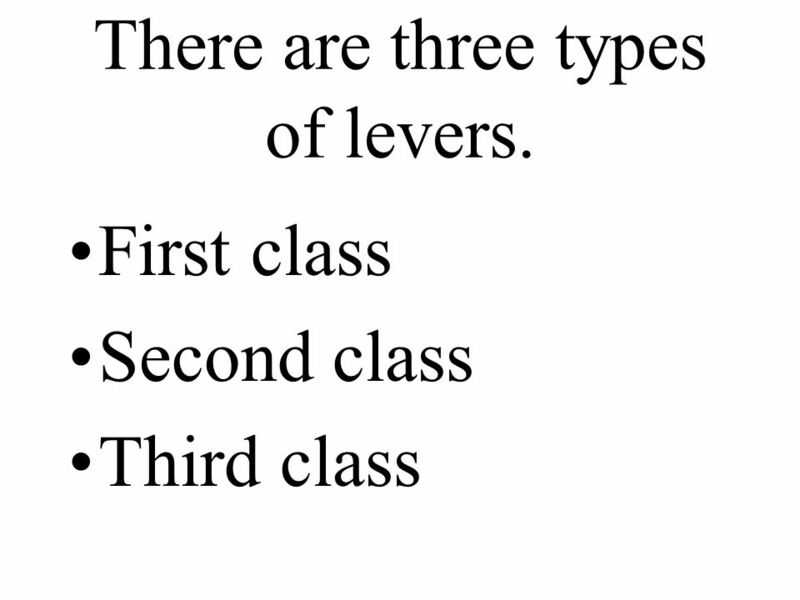 14 There are three types of levers. 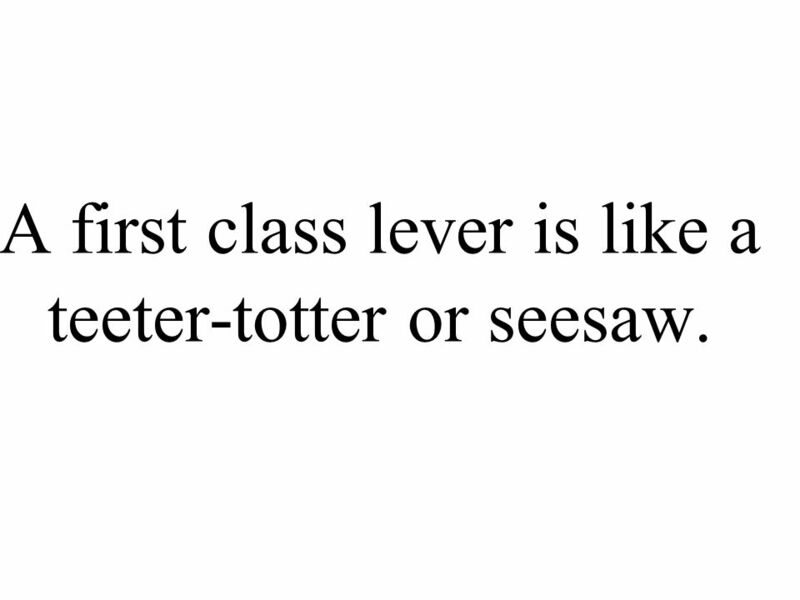 15 A first class lever is like a teeter-totter or seesaw. 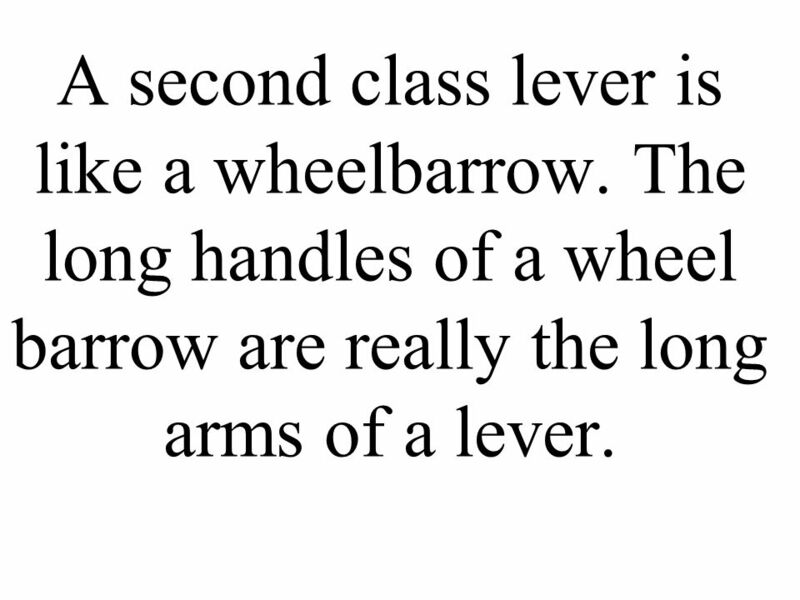 A second class lever is like a wheelbarrow. The long handles of a wheel barrow are really the long arms of a lever. 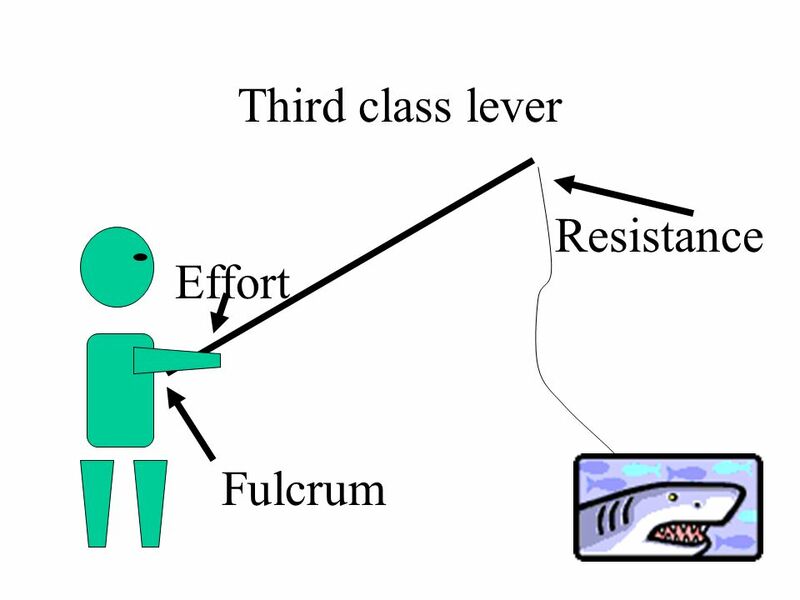 A third class lever is like a fishing pole. 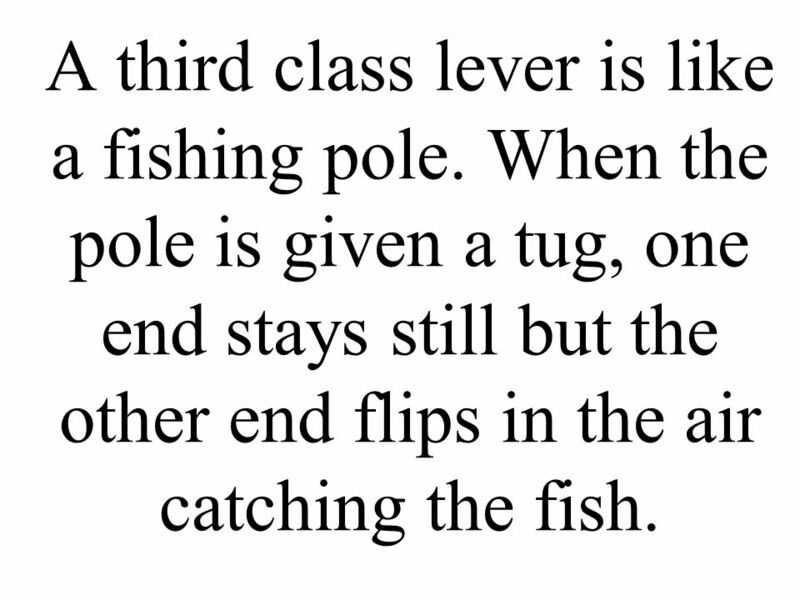 When the pole is given a tug, one end stays still but the other end flips in the air catching the fish. 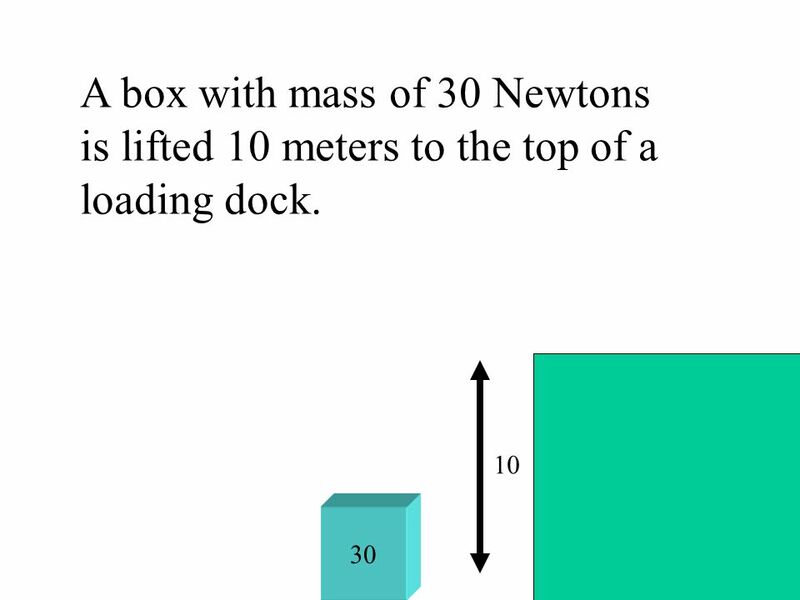 23 A box with mass of 30 Newtons is lifted 10 meters to the top of a loading dock. 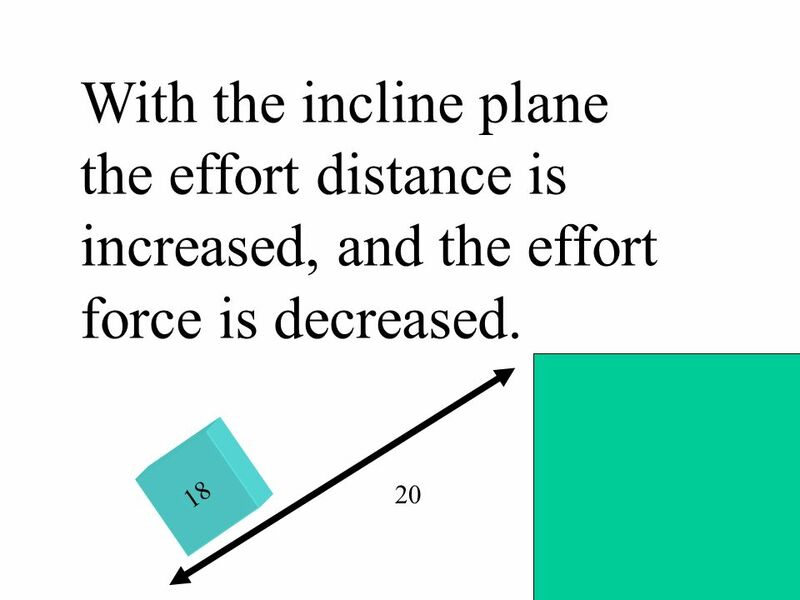 24 With the incline plane the effort distance is increased, and the effort force is decreased. 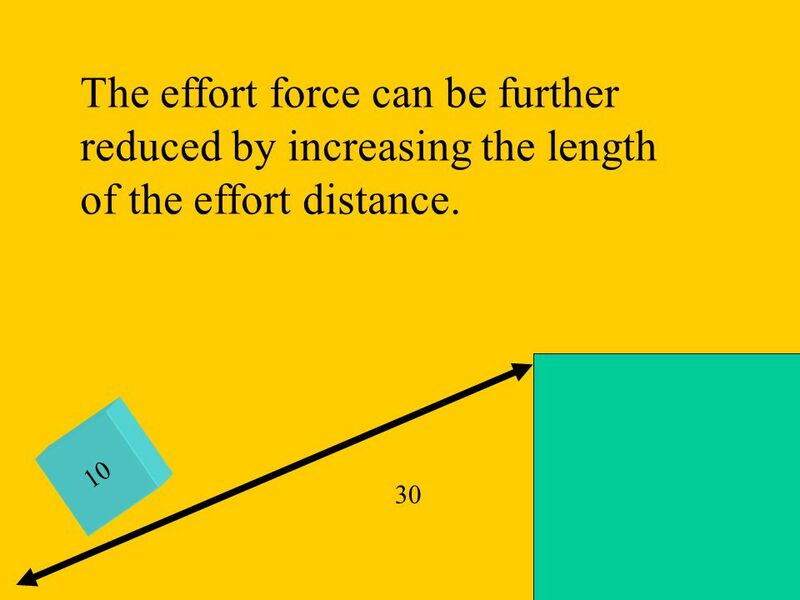 25 The effort force can be further reduced by increasing the length of the effort distance. 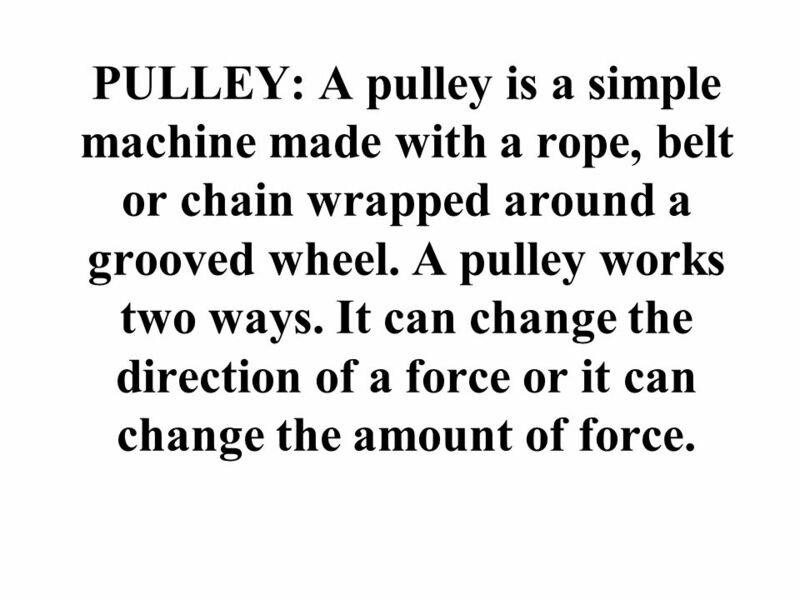 28 PULLEY: A pulley is a simple machine made with a rope, belt or chain wrapped around a grooved wheel. A pulley works two ways. 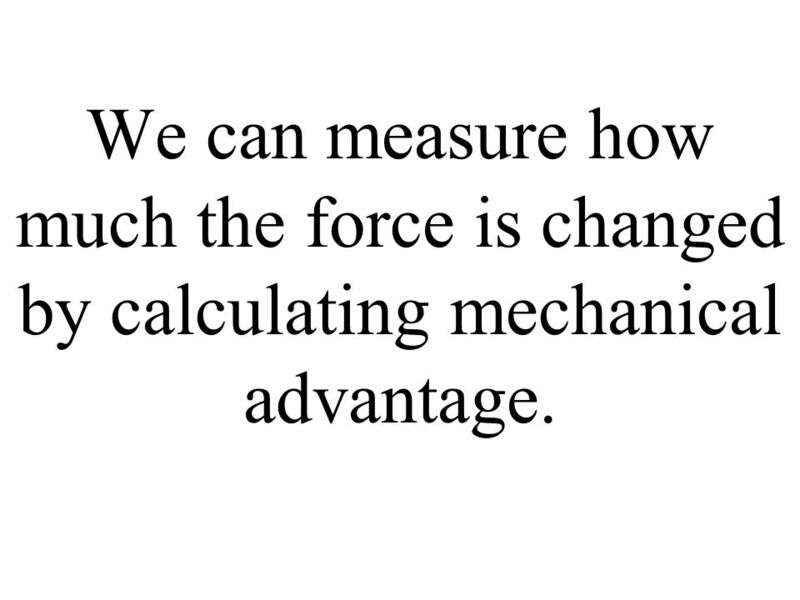 It can change the direction of a force or it can change the amount of force. 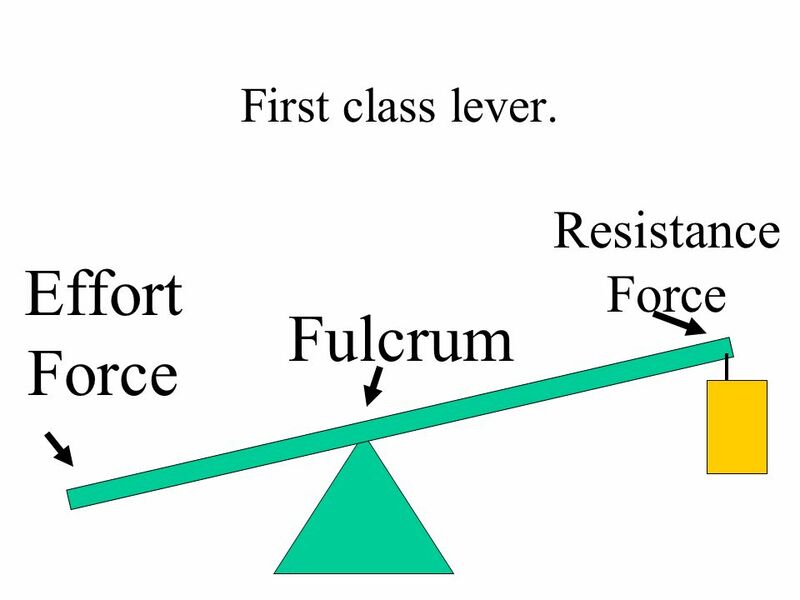 A fixed pulley changes the direction of the applied force. (Ex. Raising the flag). 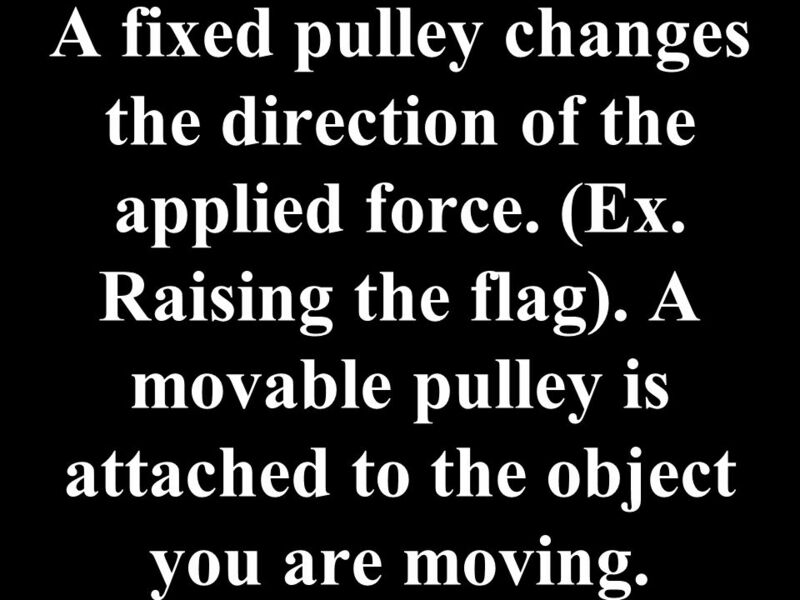 A movable pulley is attached to the object you are moving. 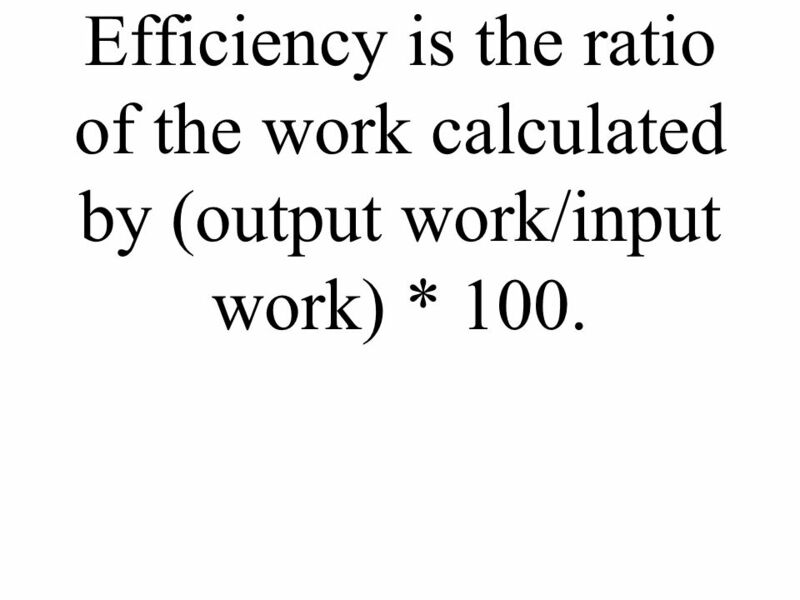 32 Efficiency is the ratio of the work calculated by (output work/input work) * 100. 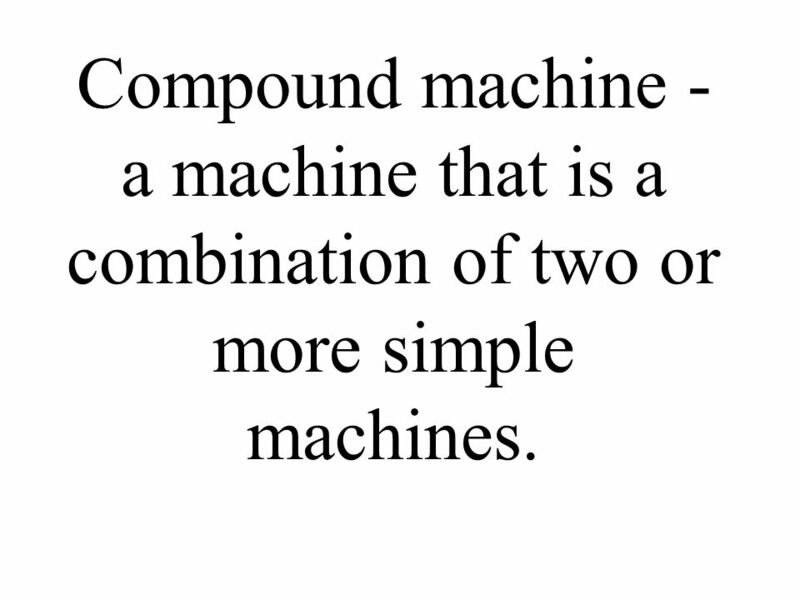 33 Compound machine - a machine that is a combination of two or more simple machines. 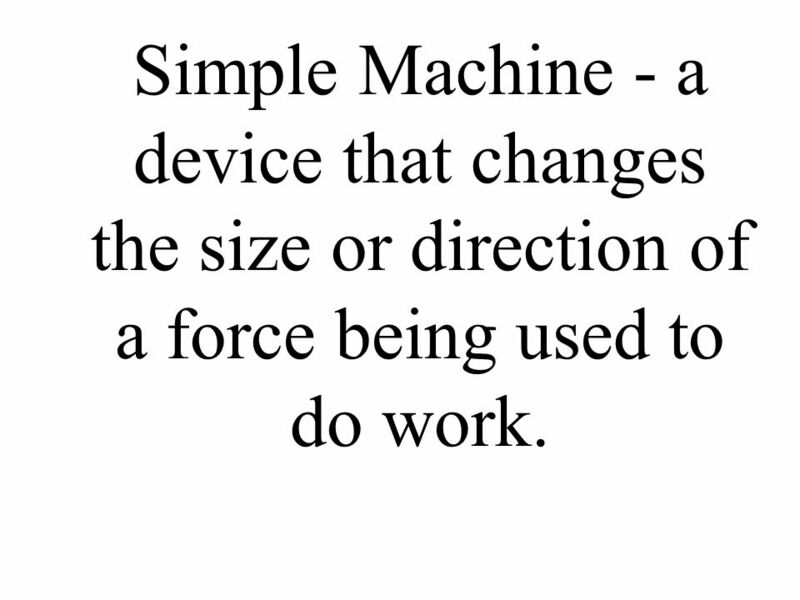 Work & Simple Machines Review. What do simple machines do for us anyway? Work, Power, & Simple Machines. Define / Describe WORK. 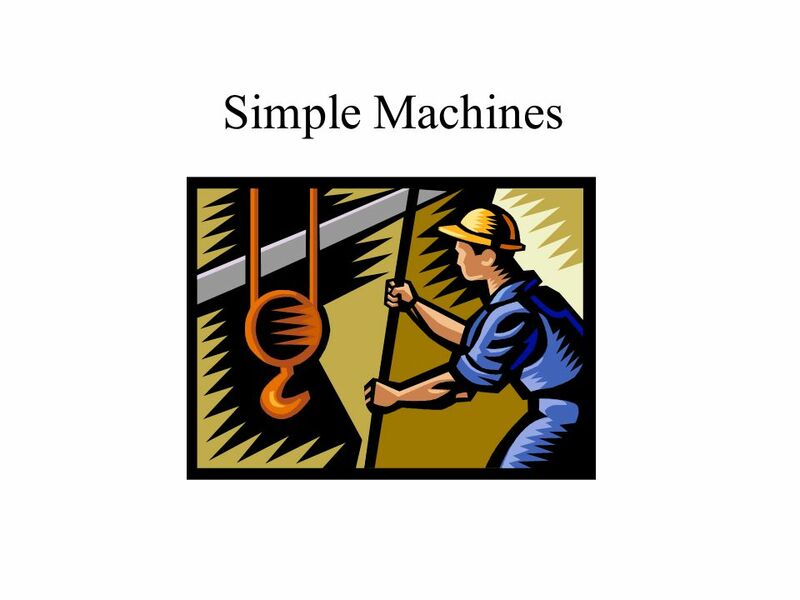 Work & Simple Machines. 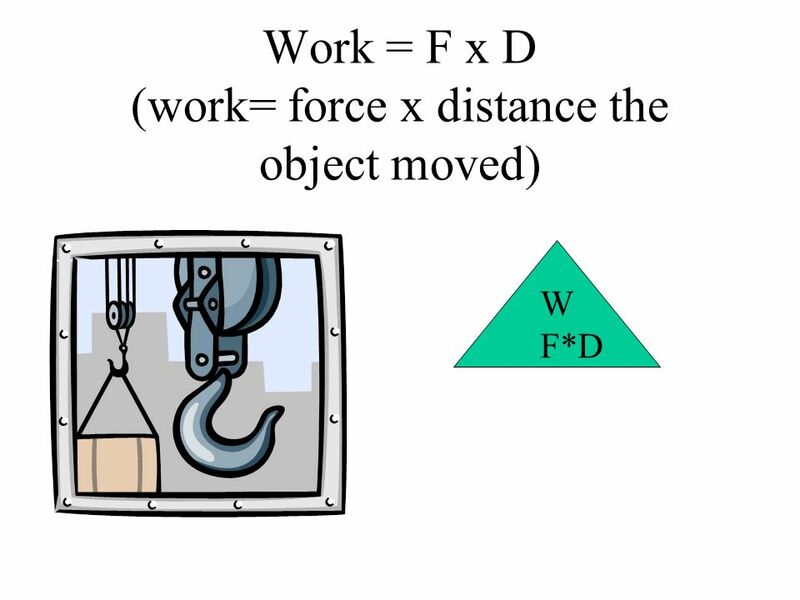 Define / Describe WORK Work is done when a force causes an object to move in the direction that the force is applied. The formula. Week 15. Monday Warm Up Week 15 What is work? Cornell Notes: Work and Simple Machines Work: the transfer of energy to an object by using a force that. Work, Power, & Machines What is work ? 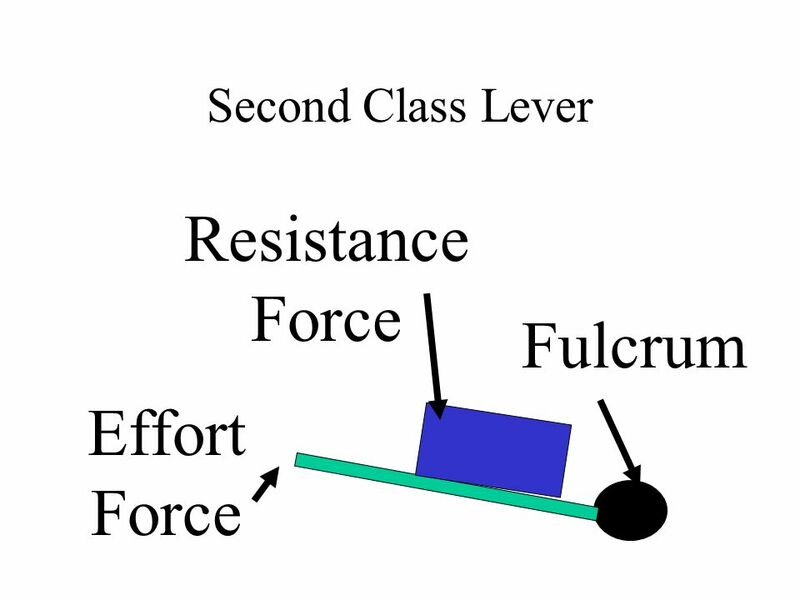 The product of the force applied to an object and the distance through which that force is applied. Unit 5 - Machines MACHINES – UNIT 5. Machines. 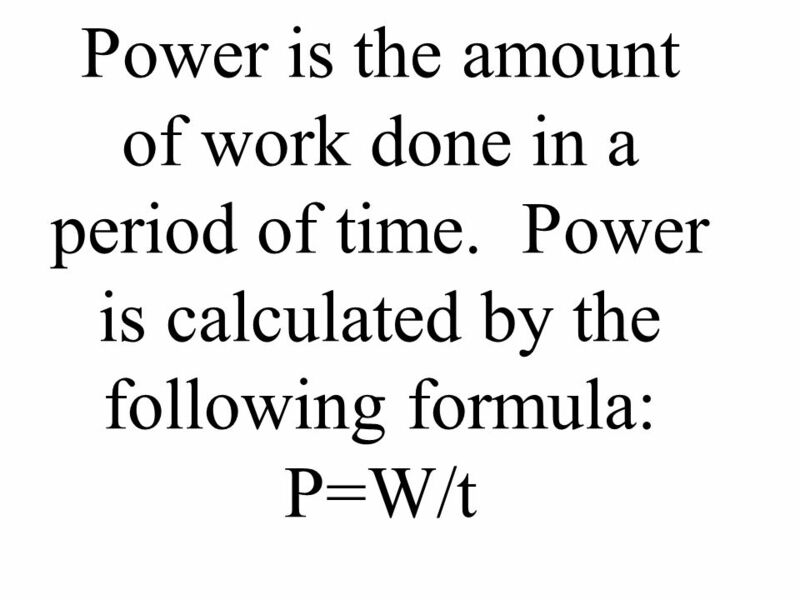 Work and Power Power is the rate at which work is done Power = Work time Remember that W = Fd So, Power = Fd t Power is measured in Watts –1. Mouse Mischief. Yes No When a machine is used to do work, the force applied by the machine is called the effort force. 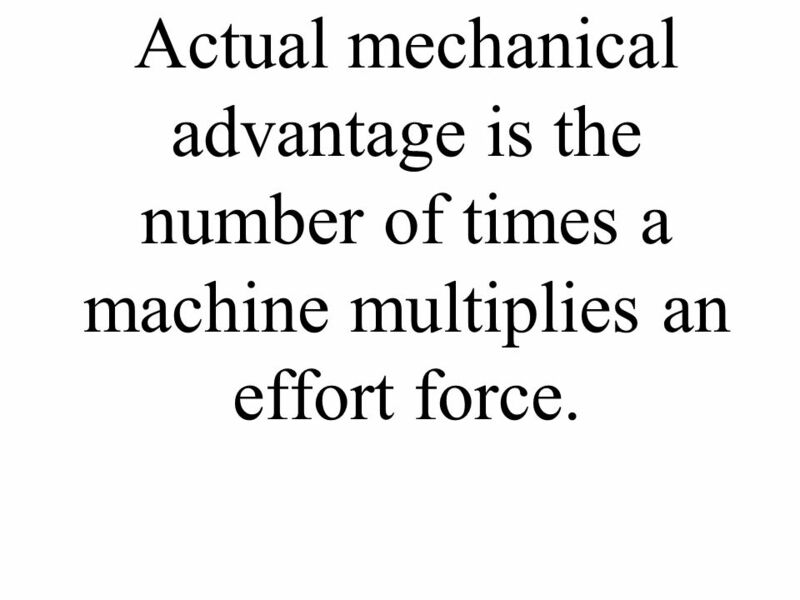 MACHINES and EFFICIENCY Chapter Key Terms Work = Force x distance Simple machine ◦ a device used to multiply forces or change the direction of. How Tools Work. 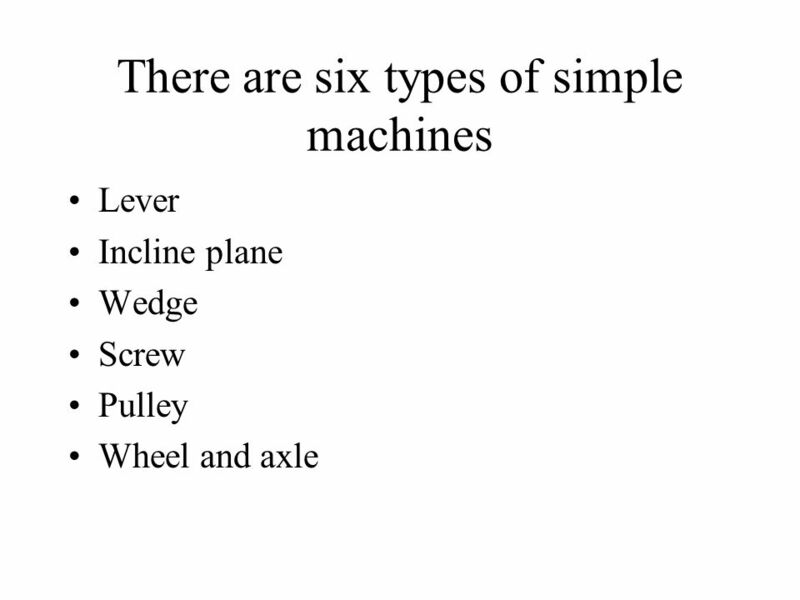 The Six Simple Machines  Lever  Inclined Plane  Wedge  Screw  Pulley  Wheel and Axle. 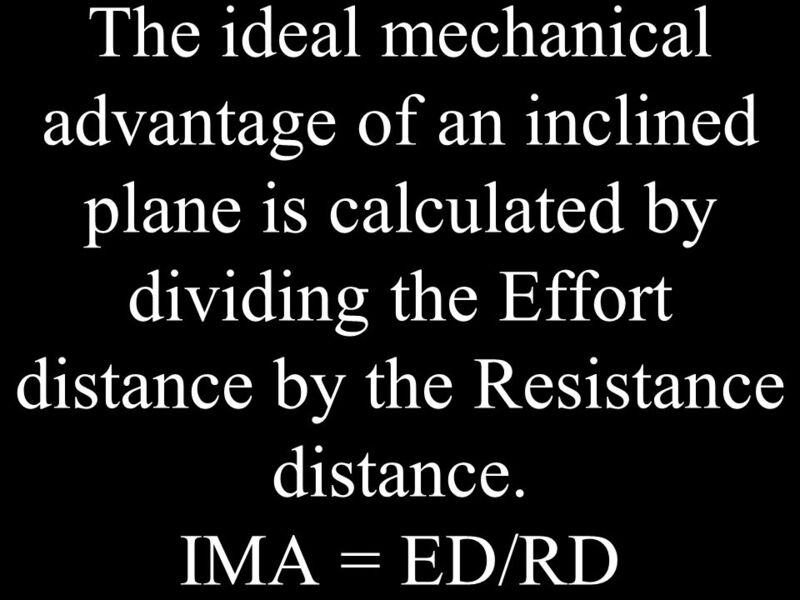 Simple Machines & Mechanical Advantage RHS Technology Education. 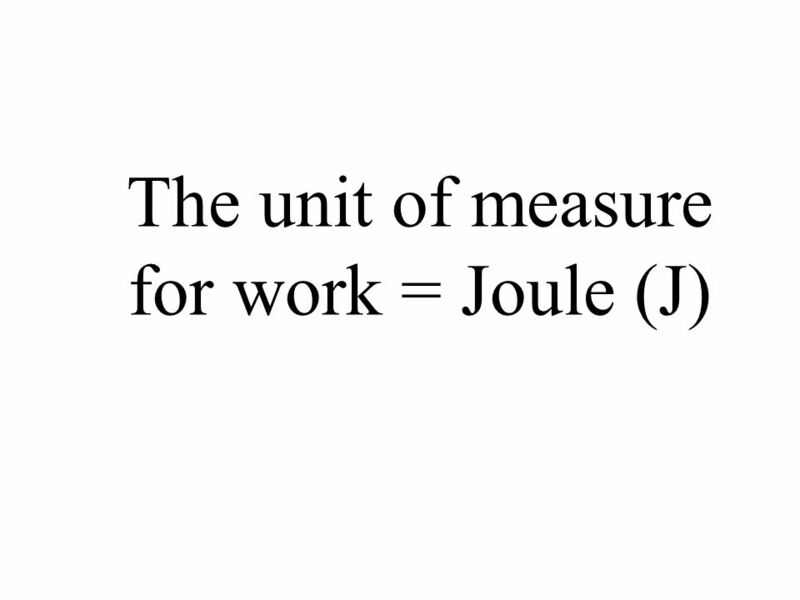 Work and Machines Chapter 5 Sec 2. What is a Machine?  Any device that makes work easier. 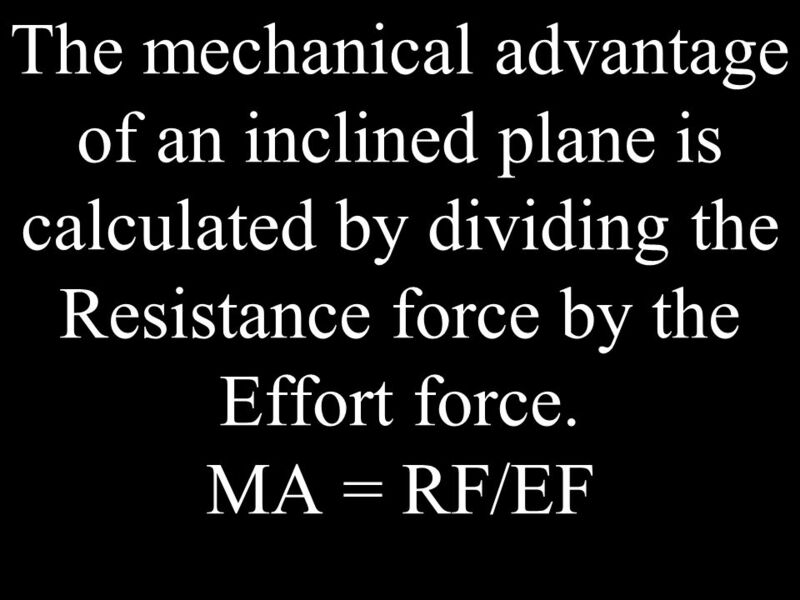 Simple Machines W O R K M e c h a n i c a l A d v a n t a g e Force Effort E f f i c i e n c y 1.